Program helps youth gain workplace experience and life skills. Hayley Fox has her eye on a career in education, not retail, but she also knows it costs an arm and a leg to go to university these days. So the St. Catharines teen, who’s heading into Grade 12 at Sir Winston Churchill Secondary School in September, knows it’s a good idea to acquire the skills she’ll need to land retail jobs to help pay for post-secondary studies. She’s got a leg up on the competition, thanks in part to the skills she’s learning through the John Howard Society of Niagara and Old Navy at the Pen Centre. Hayley has spent the summer working at clothing store H&M at the mall, doing a two-month co-op through the John Howard Jobs for Youth summer program. That program helps young people who face barriers to employment with skills such as interviewing and writing resumes while lining up employers to hire them. 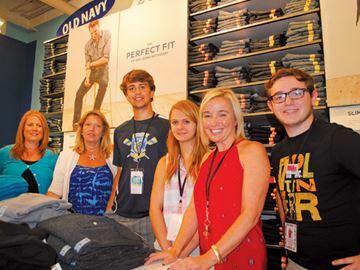 She was also one of 10 teens from the program selected to spend the day at Old Navy on August 13, getting hands-on training on such things as dressing mannequins, cashing out clients and arranging displays. The annual event, known as Camp Old Navy, has seen the store pair up with organizations such as the Boys and Girls Club and the YMCA in the past. This year was the first time it’s been held in partnership with the John Howard Society, and saw youth from Welland, Pelham, Fort Erie, Port Colborne, St. Catharines and Lincoln taking part. Fellow program participant Danny Gearing, a Pelham teen entering Grade 12 at E.L. Crossley Secondary School, wants to pursue a career in electrical engineering. But he’s thankful for the skills he’s learned such as effective resume writing. Caroline Graham, youth services supervisor with John Howard, said weekly workshops her organization holds for the youth also involves such things as conflict resolution and self-esteem. “It’s general life skills that will help them beyond just jobs,” she said. Krista Sanders, general manager of the Old Navy store, said her store took on three of the co-op students for paid placements over the summer. Her employees also volunteered to help out training the teens through Camp Old Navy — an extension of the philosophy of Old Navy owner The Gap to give back to the community. “We are very committed to getting involved,” said Sanders. 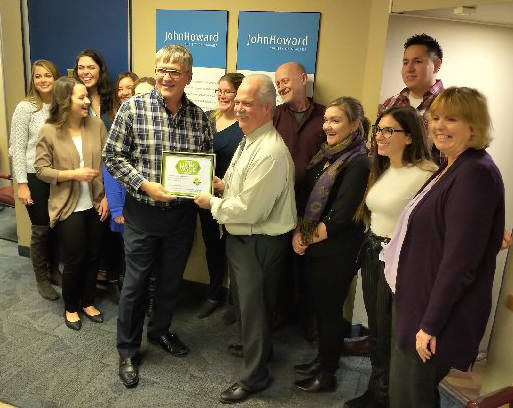 A graduation celebration for the teens in the John Howard summer jobs program was held on Friday, August 22 at the Holiday Inn and Suites hotel in St. Catharines. Click here to read speeches written by two of the John Howard Society Graduates. Watch the video of the students during their summer experiences here. Shown at Camp Old Navy at the Pen Centre clothing store on Aug. 13 are, from left, John Howard Society program manager Rachel Clair and youth services supervisor Caroline Graham, Danny Gearing of Pelham, Hayley Fox of St. Catharines, store general manager Krista Sanders, and John Howard community leader Mark Dickinson.